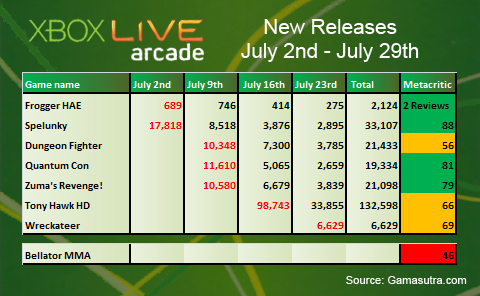 Gamasutra have published their monthly Xbox Live Arcade sales analysis for July. With the start of this year’s Summer of Arcade we would expect to see big sales and it was no surprise that the runaway success story for July was Tony Hawk’s Pro Skater HD with almost 133K in its first two weeks of release. The game split the community with mixed reviews, but certainly the Tony Hawk brand was enough to draw in the fans. The only other Summer of Arcade game to be released in July was Wreckateer. Despite good reviews all round, the Kinect only title did not fare so well with just over 6K new players in its first week. Outside of the promotion, Spelunky did best with around 33K downloads, though these are still fairly average numbers given the hype surrounding the game. Perhaps the difficulty put players off or the fact that it is free for PC. Gamasutra were unable to track the leaderboards for Bellator: MMA Onslaught, however the rest of this month’s releases, Quantum Conundrum, Dungeon Fighter Live and Zuma’s Revenge! each pulled in around 20K downloads, except poor old Frogger: Hyper Arcade Edition which only managed a pitiful 2K. Perhaps we were all still too busy with Minecraft this month?